It's the second time this year that we're featuring a French car with a milestone birthday. Endearingly, it's also the second time that Peugeot is celebrating a joyeux anniversaire on Twitter. Unlike the 405, which marked thirty years in June, today's car will not be familiar to readers on our side of the pond. Indeed, the 305 (1977-88) is somewhat forgotten over in Europe, too. Yet this Gallic workhorse served many well, particularly as a wagon, regularly beating all comers throughout its long life. It was also a diesel pioneer, on the long road to public acceptance of diesel passenger cars. And in its facelifted, Mk2 form, an expensive new rear suspension reassured Peugeot that, even in the brave new world of front-wheel drive, it was possible to attain the ride/ handling compromise its engineers wanted. No less than a packaging marvel, as evidenced by the fact that its space utilization was praised until the very end, the 305 paved the way for front-wheel-drive efficiency at an automaker that had waited until the last possible moment to make the switch. Up until the 1970s, Peugeot was a conservative company known for elegant, supple, but mechanically tough, rear-wheel-drive sedans. Like Mercedes-Benz, Peugeot had few models, and changed them rarely. With open driveshafts and thus independent rear suspensions, they were smooth, comfortable machines; if decidedly French in their general presentation and ergonomics, and stodgy handlers which leaned determinedly in corners. Much though they respected front-wheel-drive pioneer Citroën's innovative spirit and success in upmarket segments, Sochaux's engineers prided themselves on offering the sort of balanced driving experience possible only when the pair of wheels that steered were unencumbered by propulsion. And, despite an agreement with Renault to co-build engines, they were to look down upon their La Régie counterparts, who had more government involvement, and a more populist line-up and image. With comfort and tradition trumping fashion and pragmatism, this was the sort of company whose owner's manuals provided a detailed list of the different tire pressures that each different manufacturer's tires required, to return the Peugeot standard of ride. Peugeot had a peerless pedigree. However, the advent of the 1973 oil crisis forced it to focus on more pragmatic things; like the fuel-saving potential of front-wheel drive. Globalization, too, was coming. French manufacturers had learned to count on notoriously chauvinistic buyers in their home market. But exports were key to corporate growth, and the key to selling French cars across Europe was to iron out their more idiosyncratic French touches. Besides, much had been spent on developing the compact 204 and midsize 304, both of them front-wheel-drive. Early on, then, it was decided that the new 305 would be front-wheel drive. It would pull, rather than push, itself along. It must have rack-and-pinion steering, front and rear crumple zones, and side-impact protection. A thoroughly modern was demanded, with the black trim, faired corners, and wraparound lights obligatory of the era; and without rain gutters and assorted extraneous add-ons that might detract from a clean, glassy, low-waisted shape. The result was, perhaps, too fussy. Certainly, it would seem that way in the '80s, when aerodynamics became a buzzword. 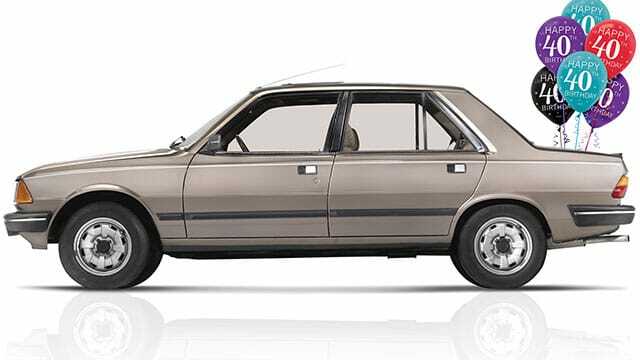 But, at the Peugeot 305's launch in 1977, the only uncommon aspects of Gérard Welter's design were the reverse-angled front fascia (a feature it shared with BMW); a slight wave in its window line, which rose to meet the windshield, and the upwardly slanted headlamps that were the house signature. On a side note, their anthropomorphic look seems more easily digestible today, when lighting groups are invited to stretch well into the bodywork. With front-wheel drive, the 305 got the drop on all its Japanese competitors save Honda. 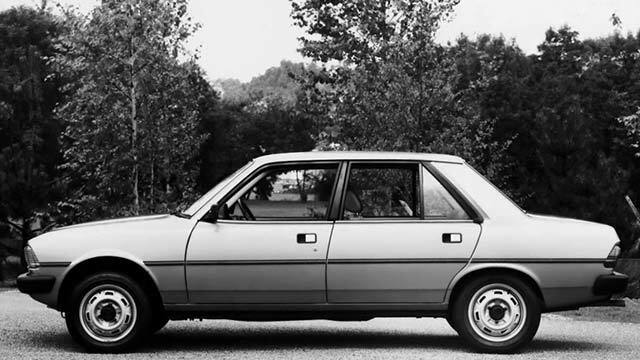 Although the Peugeot would soon look considerably older than Ford's 1983 Sierra, so too did everything else - and the Sierra continued to drive its rear wheels in a technically unfashionable manner. Britain's What Car? magazine named the 305 its Car of the Year for 1979. One of the factors influencing the decision was certainly the car's optional diesel engine, a rarity in that era. Peugeot had been diesel specialists for years, introducing a turbodiesel even before Mercedes-Benz. The 305 GRD was particularly refined, What Car? testers suggesting that it was at times hard to differentiate from its 1.3- and 1.5-liter gasoline counterparts. Diesel was not the 305's only contribution to efficiency. At the dawn of the new decade, the French government had mandated that French automakers attempt prototypes which would maintained performance while reducing fuel consumption by twenty-five percent. Peugeot chose the 305 as the basis for its car, which it named VERA (Renault built the EVE). VERA 01 used more than twice the amount of plastics as a standard 305. It weighed two hundred kilograms less, allowing for a much smaller, one-liter engine. Its drag coefficient was cut by seventeen percent, thanks to flush-mounted glass and front and rear spoilers. Some of the solutions proposed by VERA 01 were at least several years away. But the car proved that, as Peugeot test engineer Henri Saintigny put it, "you don’t have to rethink the whole car to improve fuel economy by one third." On a drive from Detroit to Knoxville, VERA 01 got 91.2 mpg. VERA influenced the production 305's aerodynamics. The facelifted Mk2 models did a fair job of updating the design, with a forward-sloping fascia for a cleaner, more streamlined look. Inside, the dashboard was simpler, if mildly less charismatic. That year, too, all 305 models got the brilliant, compact independent rear suspension of the wagon. The company’s engineers were later to remark that the rear wheels were as integral to cornering as the front; and, indeed, they first proved this with the 305. What Car? magazine remarked that the car had been turned into a "quick and agile handler with precise responses, strong roadholding and minimal body roll on corners... what’s more, this has been achieved with no sacrifice to the 305’s outstanding ride comfort. "Travel is still beautifully smooth over all surfaces, yet instead of the worrying floatiness that often upsets passengers in smooth-riding cars, the 305 allows through just the right amount of tire and road feel to preserve a sense of contact with the road surface." The 305 was not the fastest three-box sedan of its era; nor was it the best looking; nor did it feel sturdiest, nor was it the most technically sophisticated. 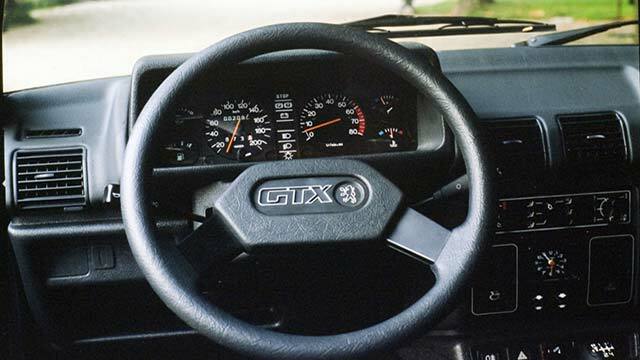 The 305 had not the four-wheel-drive system available to Alfa Romeo 33 buyers; nor the hydraulics of the Citroën BX, nor the elaborate, voice-synthesized, digital dashboard of the Austin Montego. But if neither flashy nor sporty, it was nonetheless one smooth number. As CAR magazine found in 1979, "It has a degree of 'rightness' which even its designers may not have foreseen... there are refinements in its suspension and steering which rarely appear this side of an exotic car." Partly thanks to the foresight that had given it such a long wheelbase, the 305's mixture of ride comfort and predictable handling gave it a sophisticated charm which won it many friends. The commendable capaciousness of the wagon ("Break" or "Estate"), a car whose ride quality seemed magically unperturbed by its load, ensured that the 305 retained its relevance through the end of the '80s. Peugeot reveled in being able to cite the timelessness of its engineering. Still, one wonders how well it suited Peugeot that the 305 lasted quite so long. Building it required twelve hundred more spot welds than for the newer 205 (a 1983 design). As its rivals grew larger, too, its packaging seemed less magical. And there's no doubt that by the early '80s, the 305 looked aged next to newer designs. But its engineering was indeed sound. It should not surprise, then, that Europe's Car of the Year, 1988 - the Peugeot 405 - used the Mk2 305's 1.6-liter and 1.9-liter drivetrains. The 405 took the top-of-the-line 305 GTX's comfort and added more performance and much more flair, earning its award by the widest margin of victory in the competition's history. The 405's coefficient of drag, as slippery as 0.28 in some models, showed just how much the 305-based VERA concept had taught Peugeot. The 405 made it to America, and is today well-regarded the world over. Its beauty, at launch, played a major role in that. But it was the 305, ten years earlier, which proved that many essential Peugeot qualities could survive in an era when the same studies of the same customers would result in, increasingly, the same conclusions and thus similar products. If rattled by the change, Peugeot could at least take heart that it was on the right track.